This, believe it or not, is the new Hyundai Veloster. A car that Top Gear has an unashamed soft spot for, because despite being a bit… limp to drive, it looked mad, had lopsided doors and most importantly of all, showed there was a creative streak lurking behind the worthy crossovers at Hyundai. Rather than hiding the styling of the new 2018 Veloster under an ugly camouflage wrap, Hyundai’s chosen the opposite tactic: MAXIMUM colour. The retina-assaulting patterns are part-BMW art car, part-accident in a barcode factory, but are we the only ones brave enough to think they ought to appear on Hyundai’s paint options list? Anyway, the new Veloster. Set to retain its wonky bodyshell (one door on the driver’s side, like a coupe, but two doors on the passenger’s side, like your grandma’s hatchback), the Veloster Mk2 shares its platform with the current i30. Or Elantra as it’s known Stateside. The really good news is that very platform has already served as the basis for a fabulous hot hatchback. Hyundai’s first N Division performance car, the i30N, is a sensationally fun to drive, well-priced and generally likeable hot hatch, as TG found out when we thrashed one across Europe, then gave it a second test on Britain’s gnarly B-roads. It passed with, er, flying colours. 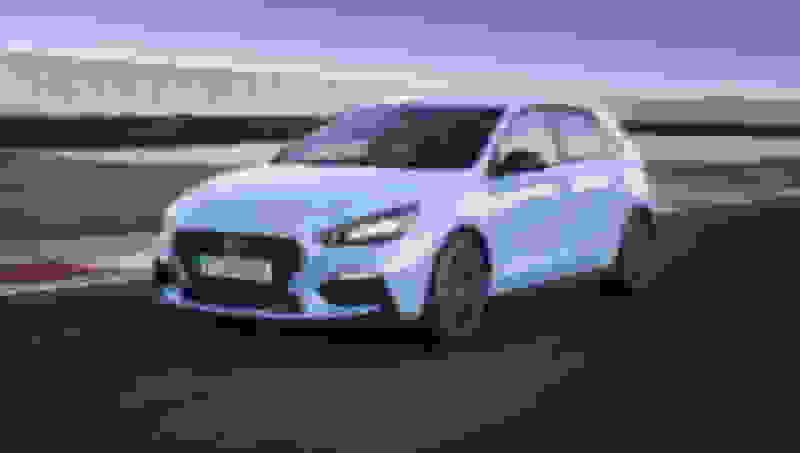 The new Veloster has already been spied testing with the 271bhp ‘N’ mechanicals in South Korea, emitting fruity parps from its exhaust and wearing purposeful alloys over beefed-up brakes. Just as Audi borrows the VW Golf GTI’s oily bits and slots them in the lower, lighter Audi TT, the i30N could serve as the springboard for an even more focused, stylish-looking Hyundai coupe-hatch thing. With silly doors. If the clashing colours and promise of Nürburgring-developed pace has you terribly excited, then we apologise. There is a caveat to all of the above. Though you can still buy Velosters in the USA, where the car’s found remarkable success, po-faced, cautious UK buyers unsure about Hyundai’s badge (and the wonky doors, truth be told) never really went for the Veloster, or its quicker Veloster Turbo sister. As a result, the oddball was kicked out of UK showrooms back in 2015. Nowadays, the craziest-looking Hyundai offered to us Brits is the Kona crossover. Cor, plastic wheelarches. So, an open plea to the company bosses, which we invite you to echo below in the comments. Hyundai, you’ve proved you can make fun-to-drive cars. You’re trying to establish ‘N’ as a force in the hot hatch sharktank. And having an extra door on one side is still a bonkers USP. Please sell this car in the UK. As anticipated, the Veloster N shares much of its aesthetic withthe Europe-market i30 N, a hotted-up version of the Elantra GT that we won't get in the States. The Veloster N's attractive Performance Blue paint is the same, as are the bits of red trim on the front fascia and side skirts. An N badge is visible in the grille, denoting this as part of Hyundai's new performance sub-brand; it'll sit above the Veloster Turbo in the lineup. We expect the Veloster N to share its mechanicals with the i30 N, too, which would mean a 2.0-liter turbocharged inline-four producing 271 horsepower and 260 lb-ft of torque. This engine powers the front wheels through a six-speed manual transmission, and a limited-slip differential is standard equipment. Additional performance features—adaptive dampers, launch-control capability, automatic rev matching, and a variable exhaust—should be on the menu, too. Last edited by nanxun; 01-15-2018 at 10:09 AM. Remember the Hyundai Veloster? It was sold in the UK for a few years, but dropped in 2014 after proving a bit too niche. It carried on in other markets, mind, proving particularly popular in the US. It boasted a surprisingly good chassis, cloaked in an asymmetrical body with a single door on one side, and a pair of them on the other. There was plenty to hold your interest. But what it lacked was power. That’s something the new Hyundai Veloster N sorts out from the off. It shares its 271bhp 2.0-litre turbo engine and other assorted oily bits with the Hyundai i30 N, which has just gone on sale in Europe. In short, then, the Veloster N is America’s Hyundai hot hatch. It comes with the same assortment of driving modes, including the N button which puts everything – engine noise, suspension stiffness, steering weight – into its hardest mode. There’s an electronically controlled differential on the front axle to ensure little (or none) of its 271bhp is scrabbled away by the front wheels. They’re 18in as standard, with 19s wrapped in grippy Pirelli P-Zero rubber optional. It comes only with a six-speed manual gearbox – aka stick-shift – with the car rev-matching downchanges if you like. Though you can turn that off and do it yourself. There are even shift lights as you approach the redline, which illuminates in different colours to show when the engine is warmed through. With engineers nicked from BMW M and Mercedes-AMG on board, this is a properly developed thing. 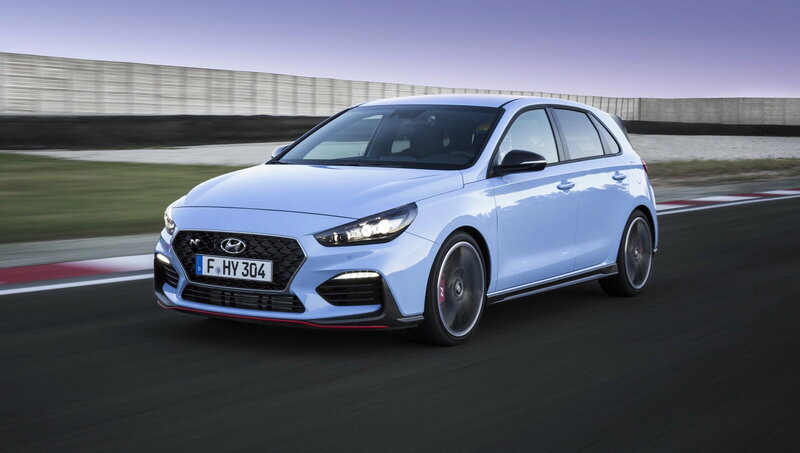 It possesses styling cues familiar from the Hyundai i30 N, too, with the same Performance Blue signature colour and much red and black trim. Those tweaks are all applied to the redesigned base Veloster, with lesser powered versions including a 201bhp Turbo. The Veloster may have had a bit of a rejig but retains its divisive door layout. The styling is perhaps a bit more conventional up front, while more aggressive at the rear, with new lights, grille and spoilers applied to a similar overall shape. Overall, it’s as quirky as ever. But sadly, it’s unlikely to make it back to the UK. Someday soon, we expect a Hyundai product to top its class without trading on “great value” as its primary attribute. We’re closer than ever to that day. Touting a multilink rear suspension in place of its predecessor’s torsion-beam axle, a nicer interior, and a more muscular appearance that belies an underlying weight-loss program, the second-generation 2019 Hyundai Veloster Turbo R-Spec performs well, yet it still substitutes a lower price for the finer allures that put the Honda Civic Si and the Volkswagen Golf GTI on our 2018 10Best Cars list. Highs: Performance per dollar, distinctive design, far more sophisticated driving character than the first-gen Veloster. Lows: Control feel still falls slightly short of great competitors, how often can you stand to hear the word “funky”? Its asymmetrical three-door configuration and hyena-like stance proclaim the Veloster’s role as a sportier coupe-like variant of the conventional Elantra GT hatchback, analogous to the way the late VW Scirocco stood in relation to the Golf. For the model’s sophomore outing, Hyundai has optimized the design with a more toothsome face and muscular haunches while also making it a little more practical by expanding cargo volume from 16 cubic feet to 20, eight more than you’ll find in a Civic Si coupe. It’s a neat bit of packaging, considering the wheelbase hasn’t changed and the car is actually a shade shorter than the original, while its roof looks more steeply raked, giving the sense that the Veloster is always going uphill. Upward is also where the interior designers were focused, employing better grades of plastic and fabric in the nicely finished cabin. Colored accents on the dash, steering wheel, and seat stitching make things considerably more interesting to look at than in the Elantra GT. The Veloster Turbo shares its new rear suspension and carry-over 201-hp turbocharged 1.6-liter inline-four with the Elantra GT Sport. This suspension improves on the original with more refined handling and a smoother ride, even with the Turbo’s stiffer anti-roll bars and dampers. Aluminum suspension components reduce unsprung mass and contribute to this car weighing 39 pounds less than the lightest first-gen Veloster we tested, a 2016 Rally Edition, and 212 pounds less than the Elantra GT Sport. The setup makes good use of the Michelin Pilot Sport 4 tires, serious performance rubber that’s standard on this driver-focused R-Spec trim (and on the manual-transmission Turbo Ultimate). Like the Si, the R-Spec comes only with a six-speed manual gearbox, also shared with the Elantra, and it’s enhanced with a standard B&M short-throw shifter (an option on other Hyundais using this gearbox). Weight-paring and sticky rubber help this R-Spec scoot to 60 mph in 6.2 seconds, whereas the ’16 needed 6.7 with the same powertrain. Thanks in large part to the Michelins, skidpad grip jumps to 0.95 g from 0.85, and stopping from 70 mph takes only 151 feet versus 173. 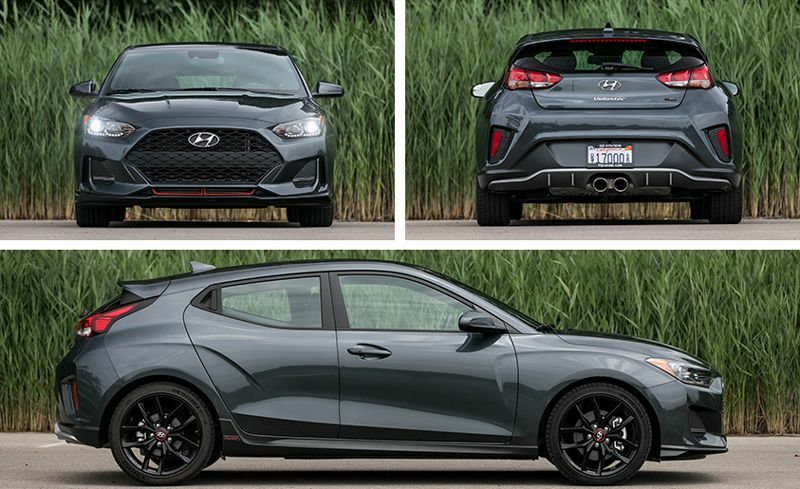 The Veloster R-Spec plays in a league with the 205-hp Civic Si coupe (6.3 seconds to 60 mph, 0.97 g, and 159 feet) and the 220-hp GTI (5.7 seconds, 0.95 g, 161 feet). The 268-hp Subaru WRX is the class hot rod with a zippy 5.5-second sprint to 60 mph (we’ve even seen 5.0 in earlier examples), but the all-wheel-drive Subie is in the middle of the pack in roadholding and braking. The Veloster’s packaging makes it a little smaller than those three in the passenger compartment, a fair trade-off for being lighter. The Hyundai is bigger than the Ford Fiesta ST, which has a more directly comparable 197-hp turbocharged 1.6-liter four but is vanishing from the U.S. market after 2018. For the record, the most recent ST we tested took 6.9 seconds to hit 60 mph, generated 0.93 g, and stopped in 166 feet. Even in R-Spec trim, the Veloster is not especially eager to turn in or to rotate, despite the assistance of brake-actuated torque vectoring. 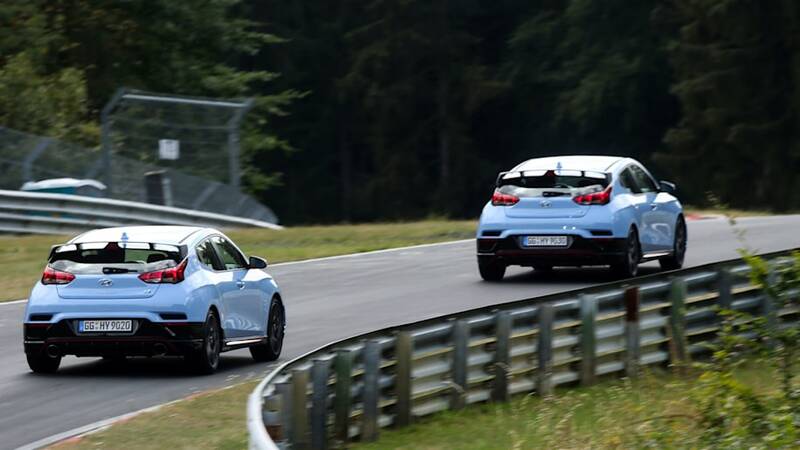 Our test driver cited the car’s superb at-the-limits balance on the skidpad, but that applies only after speeds get scarily fast out on the road; at saner velocities, the car’s tail stays resolutely stuck, and you can’t really adjust your cornering line with lift-throttle or braking tricks. This puppy won’t wag its tail and just isn’t as playful as its toylike appearance suggests, a downside of today’s mega-grippy tires. 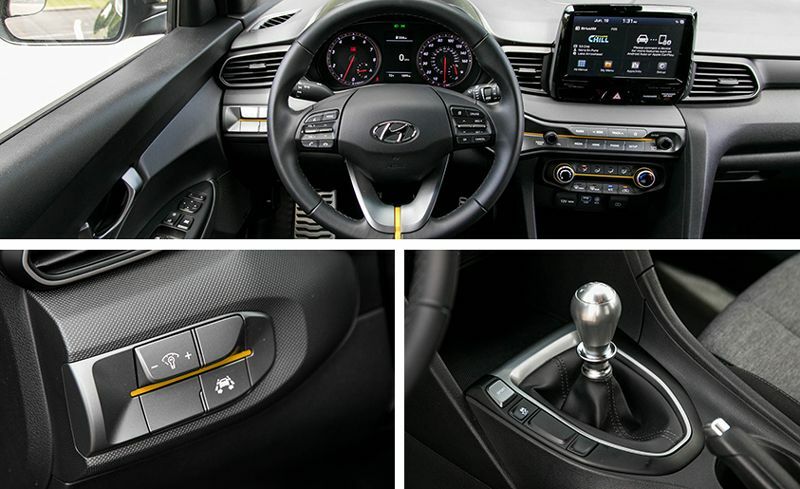 The Sport mode button on the console just ahead and to the left of the shifter also adjusts the exhaust note and, in Veloster Turbos equipped with the seven-speed dual-clutch automatic, the shift programming. That latter doesn’t apply to the manual-only R-Spec, though, so having a mode button at all really seems superfluous. The exhaust note is aggressive enough for most in the standard setting, particularly since this engine is not particularly characterful, and even the audio system’s amplified version seems to add noise without musicality. The engine is plenty flexible, with abundant low-range torque so that you needn’t shift gears often, even in heavy traffic, but neither does it reward winding it out to the 6750-rpm redline. The short-throw shifter feels sportier than the Elantra’s (which reminds us of Grandma’s Plymouths), but it slips into each gate with a slightly muddier sensation than the crisp engagement you get in the Honda. 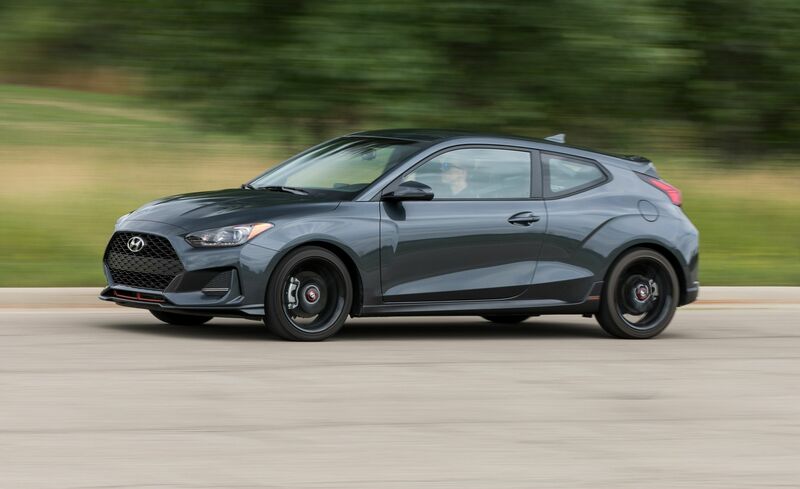 The basics here are so close to being on point that we’re looking forward to the upcoming 275-hp Veloster N, which will have niceties such as adaptive damping and multiple driving modes. Here’s hoping the new N performance division looks beyond the number behind the dollar sign to get all of its sums right. 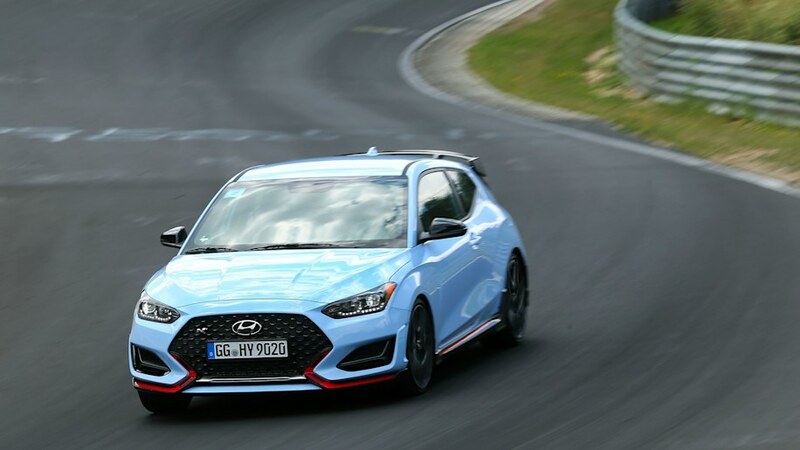 NüRBURGRING, Germany — The N in the 2019 Hyundai Veloster N's name supposedly represents Hyundai's R&D base back in Namyang. For the excuse to visit Germany I'm glad N also stands for Nürburgring, the track on which it was honed and symbolic of the car enthusiast culture it wants a piece of. Because here in the Eifel mountains it feels like a permanent party for gearheads. The parking lot where you access the Nordschleife for the legendary "tourist laps" is buzzing with cars from every corner of Europe. The air around the track is thick with barbecue smoke, hot brakes and adrenaline, high-performance engines echoing across the rolling landscape long after the track has shut down for the day. 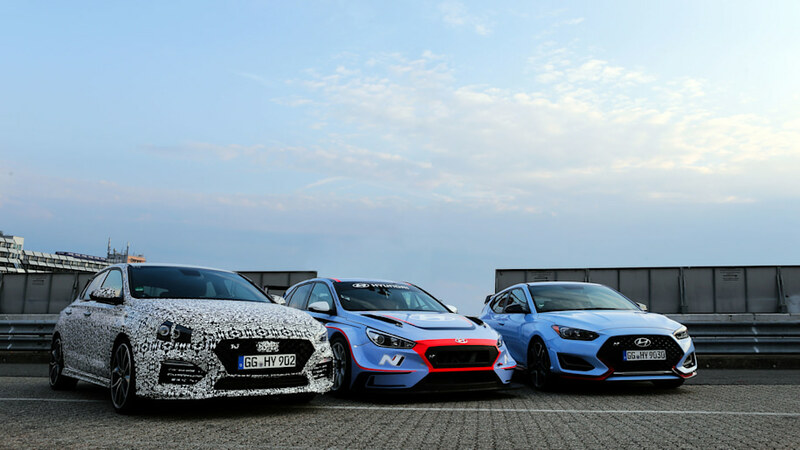 It's a heady atmosphere, and exactly the spirit Hyundai wants to capture for an American audience in the Veloster N.
The man tasked with doing that is Albert Biermann, recruited from an equivalent job at BMW M for his instinctive understanding of what enthusiast drivers want. Proof of that is evident in the number of M2s and M3s you see pounding the Nordschleife tourist sessions. Hyundai is clearly hoping he can channel that expertise into its own products. He makes the right noises about the brand's home being in Korea, but on a sunny evening in the German countryside with a pilsner in hand, it's clear this is his comfort zone and N most definitely stands for Nürburgring. Next day we're out on the track itself, the exit from the pit lane so abrupt I've barely selected second gear before filtering out onto the Nordschleife. I've bagged first place in the train of cars behind an instructor in an i30 N, the Elantra GT relative that launched the performance brand to the European market last year to critical acclaim. And I'm determined to make him work for his lunch. They might have a different look and distinct chassis tuning, but the i30 N and its Veloster cousin are pretty much interchangeable in terms of hardware. Like all N products, the Veloster N will be manual-transmission only for the near future, partly out of deference to enthusiasts and partly out of lack of a suitable in-house gearbox. And they have the same 2.0-liter twin-scroll turbocharged engine driving the front wheels with 275 horsepower and 260 pound-feet of torque. That's a big jump from the 201-hp, 1.6-liter Veloster Turbo Ultimate and puts it square between the Golf GTI and all-wheel-drive R, which is no accident given Volkswagen's performance products are the benchmark Hyundai needs to exceed. And the Veloster N is equipped to do just that. The looks are significantly beefed up while under the skin lurks significant body reinforcement and a rear strut brace to provide a solid basis for the steering and suspension. There will be a base model with 250 hp and brake-activated torque vectoring, but this Performance Package version gains 19-inch wheels, bigger brakes, Pirelli P Zero tires, a lower final drive, and a fully active, electronically controlled "Corner Carving" differential similar in spirit (if not design) to the VAQ system on SE and Autobahn level Golf GTIs. Unlike the passive mechanical limited-slip differentials used by Hondaand others, this means Hyundai can tune the car's response in corner entry and exit, reducing understeer on both turn-in and under power. A quick note about nomenclature: "Performance Package" is what Hyundai calls these upgrades in Europe on the i30 N. It was used informally by Hyundai PR reps in conversation with us, but the package name (but not content) may change for the U.S. market. This is one of seven parameters you can tune for your own customized mode to complement the dedicated N setting. There are three on-road modes too — Normal, Sport and Eco — the intention being you can toggle instantly between these as well as the N and N Custom modes via hot keys on the steering wheel spokes. Straight out of the BMW M playbook and a more obvious example of Biermann's influence, gimmicky "N Grin Control System" branding undersells the significance of such technology at this price point. Via the touchscreen I pre-programmed a more nuanced N Custom mode, but for this opening lap I go full N, the car tensing the instant my thumb connects with the checkered flag symbol. Throttle mapping, steering weight, adaptive dampers, exhaust sound, rev matching, stability control and the active differential all get dedicated calibrations, a wicked crackle from the tailpipes announcing we're ready for business. It's interesting that Hyundai and Biermann are more interested in talking about emotive responses than they are stats and figures — "BPM not RPM" as they have it in the promo material. In the high-pressure environment of a Nordschleife hot lap that translates into confidence-inspiring control responses contrived by folk who clearly understand what makes fast cars fun. The steering is linear and predictable, pedal placement is perfect, and response to them exactly as you'd want, to the extent I switch the rev-matching function off and opt to do my own fancy footwork. For a turbo engine the throttle response is excellent and more progressive than the binary 2.0-liter equivalent in the Golf. It's also got a more expansive delivery, rewarding revs rather than just dumping all the torque in your lap from tickover. In truth, the Hyundai engine doesn't feel quite as muscular as a result, but the reward is a broader power band in which to play and more natural throttle response. This is a car built for carrying speed round corners, not simply point and squirt bursts of acceleration between them. Which is as appropriate to the Nürburgring as it is a Californian canyon road. The stick shift has a quick, light throw Golf drivers will find familiar — no mere coincidence — and the Veloster feels instantly potent, alert and agile. It's much sharper on the front axle than anything VW offers too, there being none of the dumbed-down turn-in you get in the GTI and a more neutral line through corners that makes exploitation of lift-off adjustability and other hot hatch tricks much more accessible. Under power the active differential actually pulls the nose into the corner, a sensation that initially feels counter-intuitive but quickly encourages earlier and more enthusiastic use of the throttle. That it feels closer in spirit to cars like the Civic Type R or Focus RS — arguably a class above in terms of performance and price – is a compliment indeed. Frankly, the setup is pretty punchy and by the second lap I switch to my N Custom mode with the dampers dialled back from Sport Plus to Sport and the mid-weight steering assistance. Immediately the Veloster feels less jittery and flows with the track rather than pinging about this way and that. Comparing notes with our instructor, he tells me this is his favored configuration and adds that Sport Plus is really only suitable for smooth, modern circuits like the neighbouring GP track. This plays out on a fast-paced street loop taking in twisting country roads and a section of derestricted Autobahn. Here the Veloster N pulls an easy 160 mph-plus and remains locked on line doing so, making me think the WRC-inspired rear wing and the various other aero adornments are there for more than just show. With a little more head space there's a chance to take in the surroundings, the signature Performance Blue trim elements lifting an otherwise functional cabin that gets the job done but can't match European rivals for tactile quality. It's ergonomically sound, and the interface with the standard 8.0-inch touchscreen is clear and intuitive, underlining the point that the Veloster N can hack it for the everyday as well as playtime. The asymmetric design with the single, curb-side rear door remains quirky but there's just about enough space back there for a six-foot passenger behind a driver of similar size — and the Veloster is more practical and usable on this score than, say, a Toyota 86. In short the Veloster N nails the brief. Hyundai has tested sporty-driving waters in the past, but the fact that Hyundai's N Division has done a serious performance variant on its first try is impressive and testament to the talent it has hired to achieve its goals. Can we talk about N in the same breath as GTI, R, Type R, ST, RS and the rest? Hyundai has invested the hard hours into supporting customer and factory WRC rally teams and with the i30 TCR touring car on the track, the reward being credibility that an N-badged road product can trade off from the get-go. Whether this Euro-centric racing cred translates to an American audience remains to be seen, but the Veloster N at least has the dynamics right. 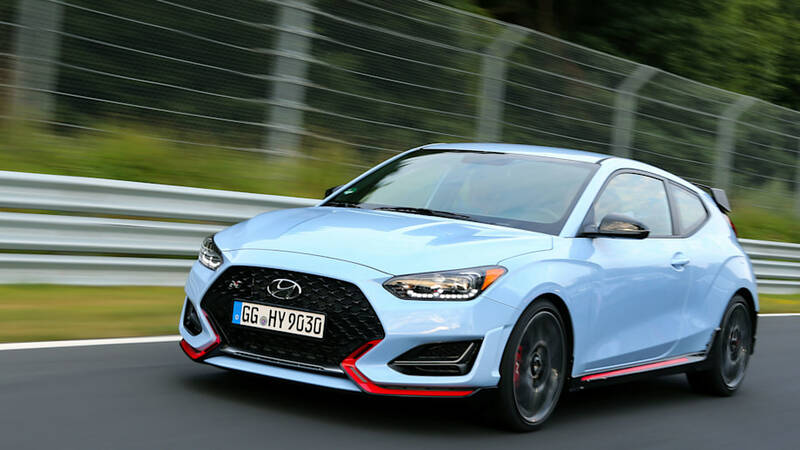 The Veloster N promises to be keenly priced too, the final figure to be confirmed but, according to a spokesperson, somewhere in the region of the $24,995 of a Civic Si Coupe and $27,310 starting price for the Golf GTI range. Feel free to speculate that the Performance Package car will be closer to $30,000 and in parity with the comparable Golf GTI Autobahn, albeit with a significant power advantage. Will enthusiasts respond? Biermann pulls on his cigarette and permits himself a grin. "Before when I came to the Nürburgring the parking lot would be full of hot hatches from Volkswagen, Renault and the others. And now I am seeing enthusiasts with Hyundais instead — this is where we need to be." That, in a nutshell, is what N stands for. And what the Veloster delivers on, straight out of the box. That infotainment screen looks obtrusive being taller than it is wide. But good for Hyundai for building this. Over the past few weeks, we’ve received some reader emails informing us of dealership markups for the new 2019 Hyundai Veloster N hot hatchback. While its starting MSRP is $26,900, we were informed that dealers were marking up the new car with price tags as high as $41,000. An online configuration shows a Veloster N tops off at just under $31,000 fully loaded. Unfortunately, markups are nothing new and other carmakers, specifically Dodge, have made noble attempts to prevent dealers from doing this. New car dealerships in the US must be franchised, meaning privately owned, so they can price the car as they see fit. The good news is that a vast majority of Hyundai dealerships are pricing the Veloster N appropriately. In fact, we did our own search of nationwide dealers and discovered something we didn’t expect: many are being sold at or just below MSRP. While there may be a few greedy dealerships trying to squeeze every extra dollar possible, they are definitely in the minority. It’s also important to emphasize that unlike, say, the now discontinued Dodge Demon, the Veloster N is not limited production. It has a planned product cycle and isn’t going anywhere, at least as far we know it. So if you go to a Hyundai dealership planning to buy a new 2019 Veloster N and discover there’s a markup, just walk away, plain and simple. it makes no sense to bother with a greedy dealership when there are plenty more out there with zero markups.